After a week of public appearances, private meetings, and unofficial goodbyes, Hillary Clinton this afternoon delivered her final public address as secretary of state, outlining a sweeping diplomatic vision for America's future and urging the use of smart power" and "creative" solutions as the nation navigates uncertain times. Clinton, speaking at the Council on Foreign Relations less than 24 hours before she will officially abdicate her role as the nation's top diplomat, emphasized the changing nature of U.S. diplomacy in a "dangerous and complicated" world, and argued that the nation must be a leader in structuring a new, more modern architecture for dealing with international challenges. "We need a new architecture for this new world. More Frank Gehry than formal Greek," she said. "We have to be smart about how we use our power. Not because we have less of it - indeed the might of our military, the size of our economy, the influence of our diplomacy, and the creative energy of our people remain unrivaled. No, it's because as the world has changed, so too have the levers of power that can most effectively shape international affairs." Outlining her view of what the new levers look like, Clinton outlined the methods with which she sought during her tenure to "widen the aperture of" U.S. global engagement and be "strategic about all the levers of global power." Among those include her belief in staying abreast of technological advancements; assisting with the development of U.S. partners, and supporting human rights across the globe. Echoing one of the paramount themes of her tenure as secretary of state, Clinton specifically highlighted her ongoing quest to achieve equality for women and minorities worldwide - an effort she called the "unfinished business of the 21st century." "The jury is in. The evidence is absolutely indisputable: If women and girls everywhere were treated as equal to men in rights, dignity, and opportunity, we would see political and economic progress everywhere," Clinton said. "So this is not only a moral issue. Which of course it is. It's an economic issue and a security issue... It therefore must be central to U.S. foreign policy." And while she maintained firm in her commitment to the necessity of using "hard power" as a diplomatic tool, Clinton argued that, as with "soft power," "there are limits to what hard power on its own can achieve." Is Hillary Clinton closing the door on politics? The compromise, she said, is "smart power" - which means not just "strengthening our alliances through new economic and security arrangements" as well as focusing on military actions. "We truly are the indispensible nation," she said. "It's not a boast or an empty slogan--it's a recognition of our role and our responsibilities. That's why the declinists are dead wrong. It's why the United States will continue to lead in this century, even as we lead in new ways." Even while touting victories in the expanding Asia-Pacific powers as a testament to the use of "smart power," Clinton acknowledged "ongoing turmoil" in the Middle East and North Africa. "I will not stand here and pretend that the United States has all the solutions to these problems. We do not," she said. "But we are clear about the future we seek for the region and its peoples. We want to see a region at peace with itself and the world--where people live in dignity, not dictatorships... where entrepreneurship thrives, not extremism. And there is no doubt that getting to that future will be diff and will require every single tool in our toolkit." Closing her remarks to a standing ovation, Clinton went on to answer a few questions about her vision of what a "Clinton doctrine" might look like - she cited America as an "indispensible nation" that must also "build coalitions and networks and put responsibility with others" - as well as foreign negativity toward the U.S. and ongoing budget struggles within the State Department. But she reserved perhaps her most emotional response for a comment from the event's moderator, Council on Foreign Relations president Richard Haass. 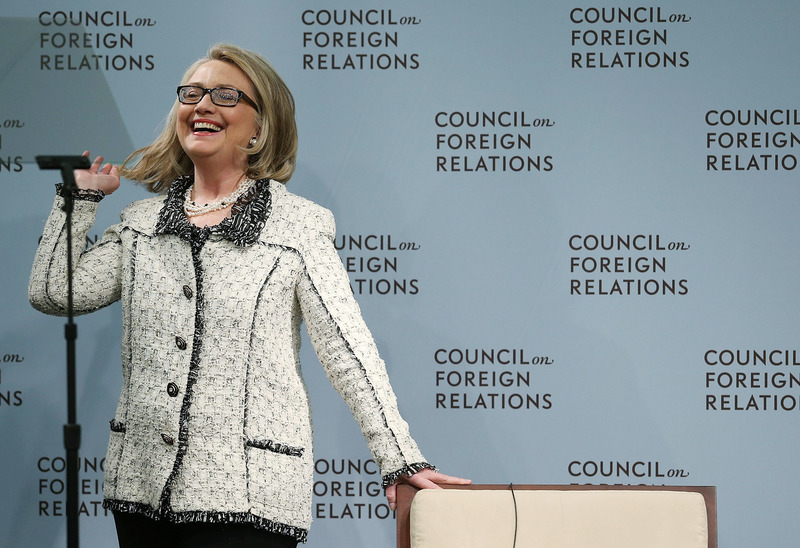 "John Kerry has some fairly large Manolo Blahniks to fill," he said, prompting a hearty, extended laugh from Clinton.